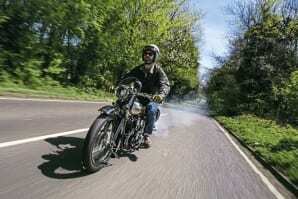 The 680 ohv Brough Superior was launched as smaller version of the iconic SS100 – and it certainly looked the part. But, for better or worse, does it share its bigger brother’s characteristics? As I travelled back from riding the 680 Brough Superior, I was trying to think about what it most reminded me of as a riding experience. Was it really a ‘miniature’ SS100 or something entirely different? As I pondered what it did most resemble, the thing I could conjure up most readily was my father’s J12 BSA; the 680 certainly feels more like that than an SS100 or indeed the Coventry-Eagle Flying 8 I rode for May’s issue. Whereas an SS100 or the Flying 8 are big, long, powerful, and possess the performance to well and truly get the rider into trouble, the 680 is nothing of the sort.